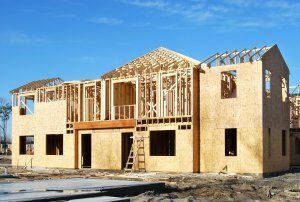 OSB (oriented strand board) is the most used structural board for bracing, flooring and sheeting in timber frame buildings in many parts of the world. Perhaps it has been surprising that OSB is not been more commonly used in building and construction in Australia. This now looks like changing. Modern OSB has attributes that mean it can compete with plywood and particleboard in many applications. OSB panels are made from long, thin layers of strands arranged laterally on the top and bottom layers and one layer laid longitudinally in the middle layer. The panel structure not only gives its OSB characteristic look, but also an exceptionally high level of bending strength. Simmonds Lumber’s Jacinta Colley says durable, fit-for-purpose, cost effective and environmentally sensitive modern OSB is now making its presence felt in the Australian market. Simmonds Lumber’s OSB SimBoard is manufactured by the German-based Swiss Krono Group. “For more than 50 years, the Swiss Krono Group has been developing industrial timber products of the highest quality and of outstanding value for money,” Jacinta said. OSB SimBoard complements Simmonds’ capacity to supply structural and hardwood products. “It is manufactured from 100%softwood thinnings harvested from forests certified as sustainability managed by the Program for the Endorsement of Forest Certification and the Forest Stewardship Council,” Jacinta said. Jacinta said Simmonds Lumber’s timber product wholesale and distribution chain had a particular focus on OSB and other structural timber products. “With our acknowledged distribution and service strengths, we are a growing global player in timber and timber-related products,” she said. “We have extensive experience in timber supply acquisition, sales and distribution. Simmonds Lumber has facilities and warehouses in Brisbane, Sydney, Melbourne, Auckland and Surabaya, Indonesia, and was the first company in the world to use DNA technology to certify the legality and provenance of timber imported from Indonesia.